Utah is one of those places that has to be seen in order to be understood completely. Unless you're actually in Utah, or the entire Southwest for that matter, you're not looking at things under Utah light, or Arizona light, and the colors of the ground and sky are not like they really appear. Just like being in an anechoic chamber and hearing a single tone from a digital source, you hear just that one, single frequency, without any harmonics introduced by environmental features such as a hardwood floor, or drapery, etc. Light behaves in a similar fashion, collecting other "frequencies" of light from reflections of the sky, the earth, and the air itself. 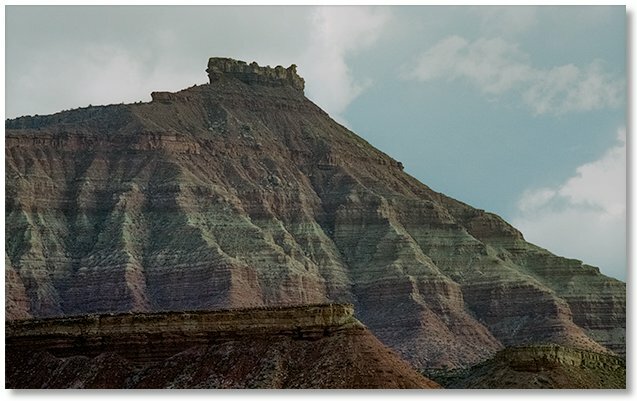 The band of cliffs above are near the town of Hurricane, Utah. I drove by them on my way to Fredonia and points east, but couldn't get any closer because any dirt road leading over to them was muddied from a recent thunderstorm and I was confined to a rental car with "city" tires and almost no ground clearance. I really wanted to take some rock samples home with me to prove how colorful this place is. 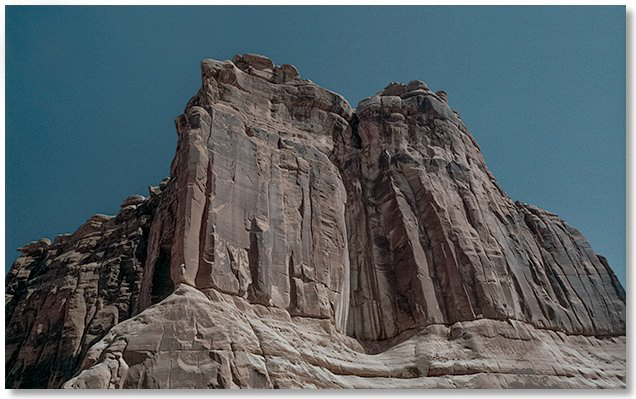 In Arches National Park, the rock formations are definitely above the ground. Unfortunately, they're often surrounded by macrobiotic soil, or whatever it's called, and even thinking about walking on it will get you eviscerated or worse. The rocks that I were able to approach were a joy to climb on, as the rock is fairly coarse, quite unlike the slippery glacier-polished rock in Yosemite National Park. Some parts of the Southwest just don't seem to make sense, although they do belong here nonetheless. My biggest gripes were the lack of conveniently-spaced liquor stores and cacti, and not always in that order. 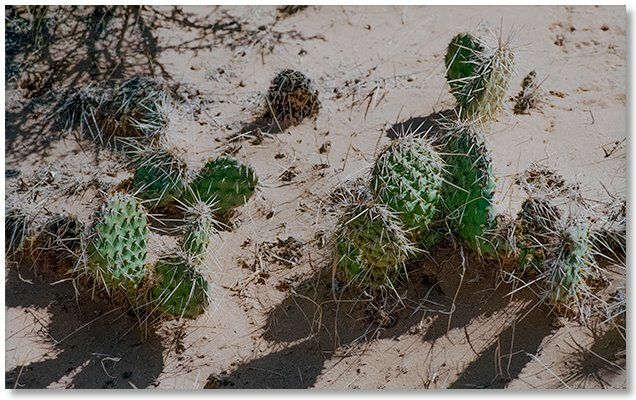 Before I visited a "desert" for the first time, the prickliest plant that I ever came in contact with was maybe a holly bush, but the prickly pear cacti that I often came in "contact" with in Utah and Arizona were in a class by themselves! If one was unlucky enough to get nailed by them (which I was), pulling yourself away from one spine might mean that you were pushing yourself toward another. Rock formations that didn't make sense were everywhere. 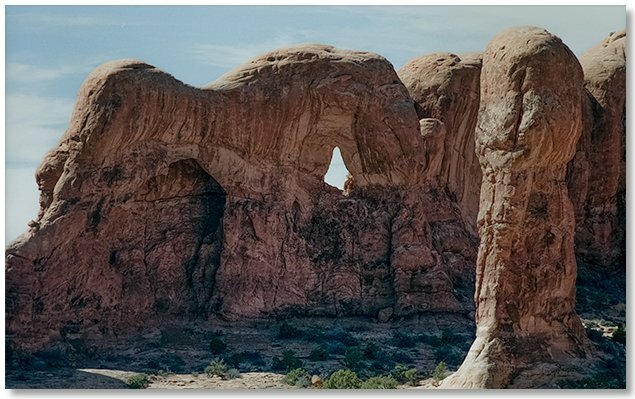 These, in Arches National Park, were supposed to represent a parade of elephants, which they did under careful scrutiny. 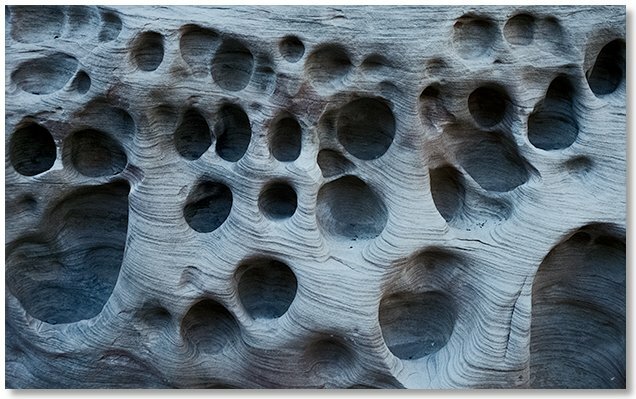 Not only did they consist of unusual shapes with unusual coloration, but they were found in unusual locations, which added to the mystery. This is near the Colorado River crossing at Hite, where to my amazement I purchased gas for the rental car that was 20 cents a gallon cheaper than what I paid at home! 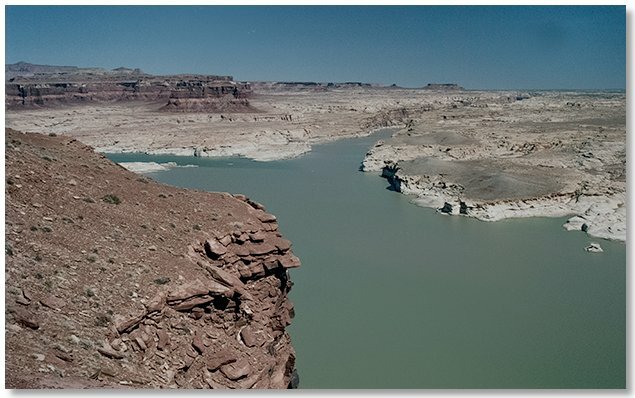 The view is looking east, with the Colorado River on the right and the Dirty Devil River entering on the left. If there was ever a place that earned the distinction of being in the middle of nowhere, this is the place. The essence of the southwest, to me anyway, are the narrow canyons that seemingly extend forever, with the beginning of one not far from the end of another. 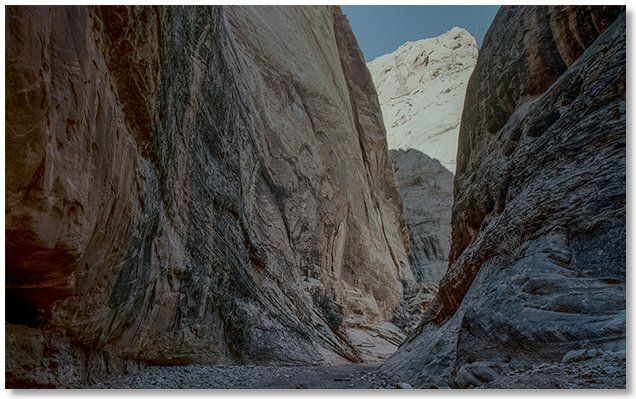 This canyon in Capitol Reef National Park seemed to make me walk in slow motion, as there was so much to see both above and below. Side canyons went un-explored because there just wasn't enough time in the day to hike more than a half mile or so, and I could have spent considerable time just sitting still, looking up at the un-ending walls. The low point of my visit came when I was approached in mid-meditation by a family hiking along with two small children who were practicing yodeling as they walked, and followed shortly by another family with a constantly barking dog.